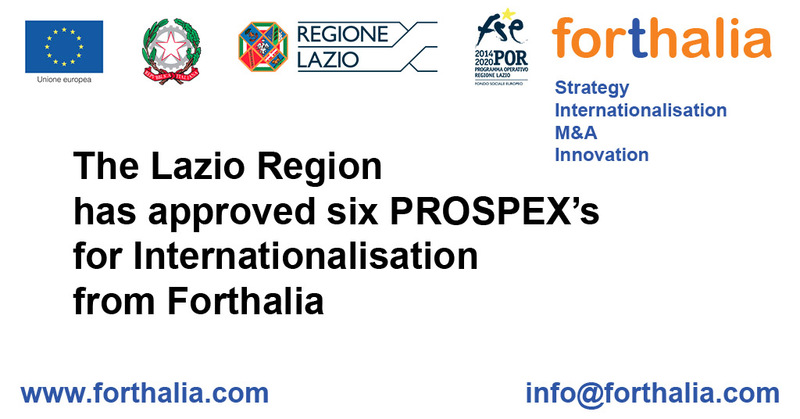 Lazio Innova, the special company of the Lazio Region, has approved six PROSPEX for the Internationalisation of companies from Lazio, presented by Forthalia. PROSPEX are projects with a 50% non-repayable contribution aimed at helping companies from the Lazio Region in their internationalisation processes. The deadline for submitting applications is February, 28th 2018. Each PROSPEX is articulated in a specific way and is designed to maximise the result for participating companies. • and many other activities carried out with high professionalism by our expert staff. Interested companies are invited to contact us to find out in detail how the PROSPEXes of interest to them are structured so please send us a message via our our web contact form, or sending an email to: info@forthalia.com or calling at: +39-02-4125347. The provided services benefit from numerous synergies thanks to Forthalia's direct presence in different markets, the significant experiences of its consultants, various partnership agreements, the projects that Forthalia is currently carrying out and has carried out in the past within the MISE Voucher Internationalisation, as well as several other institutional initiatives and the finalised assignments for many satisfied companies. By joining one of Forthalia's PROSPEX, above receiving the foreseen services and a 50% grant, the company gets also a wealth of experience made available by the synergies and expertise provided by Forthalia. Forthalia is a consulting firm specialised in successfully assisting companies in their internationalisation processes. Forthalia is accredited by various institutions such as, for example, the Italian Ministry of Economic Development, the Lombardy Region, the Region of Lazio, the Chamber of Deputies (Italy's Parliament) and several others.